I feel my best when I focus on making healthy food choices and exercise regularly, so on a typical week I would workout 5-6 times. I always take a rest day once a week as my body will feel too tired if I don’t and while good quality rest and sleep are such an important part of health and fitness, I never workout less than 3-4 times in a week either. The last time I took entire week off was when I had the flu in 2008! In terms of food, I really listen to my body by eating when I’m hungry and stopping before I feel too full. I find eating this way means that I’m rarely tempted to overeat, and I never think about counting calories. I have to work harder to stay lean as I get older, because my body would like to be bigger than it is, but I love feeling healthy, strong and fit. I usually do 3-4 classes at Pilates Plus Dublin, which combine plenty of core work with a full body strength and conditioning workout. 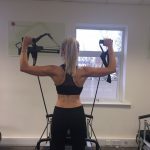 I do an hour of weight training with a personal trainer once or twice a week, as I really enjoy lifting heavy weights, and I also try to fit in some cardio on the cross-trainer or treadmill a few times a week. We’re lucky to have a home gym, although it also means that I have absolutely no excuse not to train on dark, chilly winter mornings or evenings! I eat a whole foods plant-based diet, as having experimented with various eating plans over the years, I’ve discovered that this type of eating makes an enormous difference to my energy levels, immune system health, fitness, mental clarity and general mood. However, we’re all biologically unique and one type of diet doesn’t necessarily suit everybody. It’s important to pay attention to what type of food makes you feel your best. The one rule that does apply to us all is to drink more water, eat more green vegetables and include omega-3 fat in your diet everyday! I think that they can be really important for people and help them to stay focused and on track with a healthy lifestyle. Making positive choices during the week can feel easier when you know there’s a treat to look forward to at the end of it. Again, I listen to my body when it comes to treat days. If I really want something then I’ll eat it and enjoy it, but I might also go for weeks without a cheat snack or meal. However, I definitely enjoy relaxing when I’m on holiday or at a wedding, and eating and drinking things that I try to normally avoid. I really enjoy Indian food and dark chocolate, so they would be my two choices for a cheat day. Yes, absolutely. I begin to feel lethargic and sluggish even if I go two or three days without exercise, and as it makes such a dramatic difference to my energy, mood, sleep and confidence levels. There are worse things to be addicted to I guess! I’m a big SPF fan of wearing an SPF50 ever single day of the year. Along with avoiding smoking and refined sugar, protecting your skin from UV light is one of the best ways to avoid premature ageing. I always feel good when I have semi-permanent eyelashes in and it saves so much time fiddling around with strip lashes, I go to Up To My Eyes in Greystones every 4-5 weeks to have them done. Although my hair is long, it’s quite fine and naturally very straight so it never holds a curl. I’ve been getting hair extensions by Ceira Lambert for the past 7 years and love how they make my hair so thick and easy to style. I wear Gold Fever hair Extensions, which never damage my own hair and are very easy to manage. I really enjoy getting the HydraFacial at the Beacon Face and Dermatology Clinic in Sandyford. It helps my skin to stay looking plumped up and hydrated for three weeks afterwards. I definitely do believe that health and fitness should be approached holistically, rather than being reduced to calorie-counting and how much weight one can bench. Mental and emotional well-being, stress management, quality sleep, relaxation and having a supportive network of friend and family in your life need to be viewed as an essential part of the health and fitness picture. I find that my fitness routine gives me time out from a busy schedule and helps me to unwind. I also meditate when I’m under stress and take time out for myself when I need it. I like to switch off at weekends and head down to the countryside to relax with my husband and friends, and I try to get away for short breaks and holidays as much as work allows. I’m a very positive person and have been working on eliminating negative people, influences and thought patterns from my life over the past few years. I find it incredibly effective and it has really helped me to stay calm and see the best in every situation. I think the best tip I was given was when I started weight training back in 2009 at BodyByrne Fitness. Owner Paul Byrne told me that the secret to fitness for life is about having a strong mental attitude. Your body will do the work and human body is far stronger and more adaptive than most of us realise, but the trick is getting your mind to believe you can do it and refuse to give up. That really helped me as a beginner. We all have to start somewhere, so don’t be afraid to ask questions and figure out what type of exercise suits you best. It must be enjoyable, challenging and fit into your lifestyle and budget. My family and friends inspire me the most, and I’m so lucky to have the most loving and supportive husband and family. I love to surround myself with friends that inspire me, and all of my friends have traits that I really admire. I’m really a tomboy at heart. 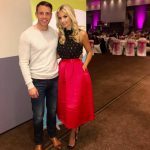 I enjoy getting dressed up and it’s obviously a part of my job, but I’m not that comfortable in dresses and heels and far prefer my gym gear or jeans and a jumper. Growing up, I was happiest in muddy wellies and riding my horse, and I still much prefer the quiet countryside to city life. A glass or two of Champagne on a special occasion and my banoffee pie from my new book Eat Yourself Fit – although neither make me feel particularly guilty! 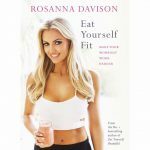 Rosanna’s new book, Eat Yourself Fit is available for €19.99 from easons.com and all good bookshops.